Block Paving is the most beautiful, practical and durable way to pave your driveway, patio or pathway. Any block paving installed by GM Home Improvements will enhance the appearance of your home. we work with every customer to create exactly what they have in mind, beginning with the design stage and continuing through to completion of the project. We offer high quality products installed by our own highly experienced and skilled workforce. Additionally, the fact that we are approved should give you further peace of mind in us delivering your project as specified, on time and to budget. We have a full range of Traditional, Contemporary, Cobbled, and Natural Paving Blocks available, all made to British Standards. Permeable paving is a special type of block paving with slightly larger gaps between the blocks. This allows surface water to drain between the blocks into a specially designed sub-base where the water drains slowly away as it would naturally. The open, graded sub-base materials and geotextile layers must still be compacted in the same way as an impermeable paving sub-baseto provide a firm foundation for the paving system to be trafficked, but will have voids between the pieces of stone. 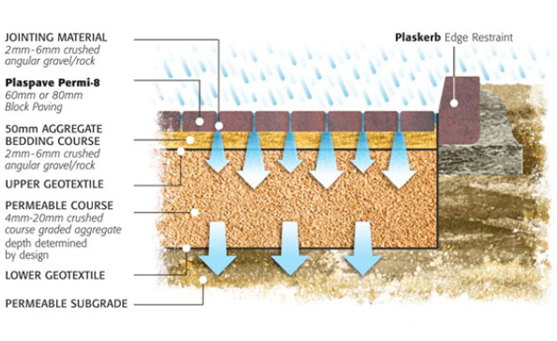 This system allows all rainwater falling onto the paved area to infiltrate down through the joints or voids between the blocks, passing through the constructed layers below and eventually into the sub-grade. The temporary reservoir created by the 33% void ratio of the sub-base may store some of the water before it eventually infiltrates the sub-grade GM Home Improvements recognizes that this ‘zero drainage’ system requires no discharge into traditional drainage systems, removing the need for pipes and gulleys resulting in cost savings. Another great job done! Excellent work. Second time Gary has done a job for us and we are very pleased. He is polite,honest and puts the customer at ease. His work from start to finish, is neat and professional. Highly recommended! The work was carried out with good planning and precision, time scale was adhered too and budget also kept within limit.I would havbe no problem recommending GM home Improvements to friends or family and have already had requests from neighbours who have seen all the work carried out on my property. Gets the job done quickly and effiently.. you hardly know hes there!!! Best quote i ever got. Brill and easy to get on with. Will 10/10 recommend for any type of work. Did my friends paving and so happy with it. Great job. Called on a Tuesday morning with a leaking roof. Gary was in the area and came that morning. He assessed the problem and showed us photos via his phone. He was able to fix the problem that morning which was great as lots more rain had been forecast. Great job, honest and reliable. No leaks since! Full Roof. Gary has just completed a full re-roof on our 1950’s house. The advise and assistance up front was a great help in deciding what materials to use, and the work carried out is to a very high standard. Excellent service, and I wouldn’t hesitate to recommend Gary, or to use him again ourselves.